Geez, bystander. Got your work cut out for you today. 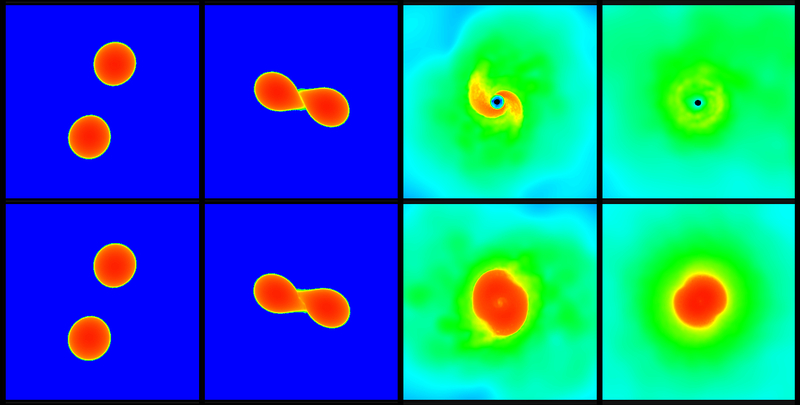 The Electromagnetic Counterpart of the Binary Neutron Star Merger LIGO/Virgo GW170817. Last edited by bystander on Tue Oct 17, 2017 6:27 pm, edited 1 time in total. Last edited by bystander on Tue Oct 17, 2017 7:02 pm, edited 1 time in total. Yoicks, bystander - is there any science publication that HASN'T published on this?! I'll add this article from Physics, the APS journal. MargaritaMc wrote: I'll add this article from Physics, the APS journal. The intro to the special issue at ApJL was good. bystander wrote: The intro to the special issue at ApJL was good. Actually, the New York Times piece was good too - very useful to pass on to friends who want to know what I am so very excited about! This was and is a great confirmation of expectations as to the site of heavy element production in the universe. (1) Condense two close orbiting massive stars out of interstellar medium. (2) Allow cores of two stars to cook light elements up to iron. (3) Return excess gas and light elements back to interstellar medium via core collapse supernovae, producing binary neutron star pair. (4) Allow orbital decay to bring two neutron stars into contact, producing kilonova. Alchemy is easy, if you have enough time and material. That's very nice, Bruce. Thank you! Your very welcome. And all four steps are automatic, due to universal law. Isaac Newton, Tycho Brahe, grumpy Swedish writer August Strindberg (world famous in Stockholm), and others, were missing a few ingredients. BDanielMayfield wrote: Alchemy is easy, if you have enough time and material. We call those "one pot meals". So there goes MOND down the drain, and Einstein's "biggest mistake" gets even bigger. Perhaps not. Einstein's "biggest mistake", as he saw it, was introducing the cosmological constant "to keep the cosmos constant" and prevent it from either expanding or contracting. But what is said in the article above is that a cosmological constant may be the best explanation for the dark energy in the Universe. So Einstein may have been absolutely right in seeing the need of introducing the cosmological constant. He was just dead wrong about what the cosmological constant would do. Perhaps not. Einstein's "biggest mistake", as he saw it, was introducing the cosmological constant "to keep the cosmos constant" and prevent it from either expanding or contracting. But what is said in the article above is that a cosmological constant may be the best explanation for the dark energy in the Universe. So Einstein may have been absolutely right in seeing the need of introducing the cosmological constant. He was just dead wrong about what the cosmological constant would do. Einstein produced a general equation that couldn't rule out the existence of a cosmological constant. Einstein was unhappy in not knowing a prior the value of that constant. But he was only wrong it was in believing that that equation had a stable solution ... which it doesn't. Millions of years ago, a pair of extremely dense stars, called neutron stars, collided in a violent smash-up that shook space and time. On August 17, 2017, both gravitational waves—ripples in space and time—and light waves emitted during that neutron star merger finally reached Earth. The gravitational waves came first and were detected by the twin detectors of the National Science Foundation (NSF)-funded Laser Interferometry Gravitational-wave Observatory (LIGO), aided by the European Virgo observatory. The light waves were observed seconds, days, and months later by dozens of telescopes on the ground and in space. On August 17, NASA's Fermi Gamma-ray Space Telescope and the European INTErnational Gamma-Ray Astrophysics Laboratory (INTEGRAL) missions detected gamma rays just seconds after the neutron stars merged. The gamma rays were much weaker than what is expected for sGRBS, so the researchers reasoned that a fast and narrowly focused jet was produced but must have been pointed slightly askew from the direction of Earth, or off-axis. Last edited by bystander on Thu Dec 21, 2017 8:42 pm, edited 1 time in total. Clarification: I was just using "Einstein's biggest mistake" as another way of saying cosmological constant. He himself called it that, but ironically, it now seems very likely that he wasn't wrong at all, and thus his real mistake was thinking he was wrong. It is this irony that gets bigger as the need for his cosmological constant grows. Einstein's "biggest mistake", as he saw it, was introducing the cosmological constant "to keep the cosmos constant" and prevent it from either expanding or contracting. But what is said in the article above is that a cosmological constant may be the best explanation for the dark energy in the Universe. So Einstein may have been absolutely right in seeing the need of introducing the cosmological constant. He was just dead wrong about what the cosmological constant would do. Clarification: I was just using "Einstein's biggest mistake" as another way of saying cosmological constant. and thus his real mistake was thinking he was wrong. <<Astrophysicist and author Mario Livio can find no documentation that puts those words [i.e., “biggest blunder”] into Einstein’s mouth (or, for that matter, his pen). Instead, all references eventually lead back to one man, physicist George Gamow, who reported Einstein’s use of the phrase in two sources: his posthumously published autobiography My World Line (1970) and a Scientific American article from September 1956. So he turned his attention to the correspondence between Einstein and Gamow, and it is at this point that Gamow’s story begins to look even worse. “When might Einstein have used this expression with Gamow?” Livio writes in the book. As Gamow tells it in his autobiography, he and Einstein were quite close, with Gamow visiting the aging scientist every other Friday as the liaison between the Navy and Einstein during World War II. “He describes what good friends they were, how Einstein would greet him in one of his soft sweaters, and so on,” Livio explains. Moreover, this is not to say that Einstein was at ease with the cosmological constant. “I’m not saying he didn’t regret it,” Livio says. “He definitely regretted it. He wrote about that to a number of friends. He thought it was ugly.” But to say it was his “biggest blunder” implies a level of regret that it seems Einstein did not feel. By contrast, when he did write about the error (which, it should be noted, in more recent years, has turned out to be less clearly an error than Einstein thought, but that’s a whole other story), he did so with a dispassionate tone that conveys comfort with the notion that science would overturn some of his work. In a 1932 paper with Willem de Sitter, Einstein wrote, “Historically the term containing the ‘cosmological constant’ Λ was introduced into the field equations in order to enable us to account theoretically for the existence of a finite mean density in a static universe. It now appears that in the dynamical case this end can be reached without the introduction of Λ.” And that was that.